I recently became addicted to Google's Fast Flip, which as far as I'm concerned is the best way to browse through news sites. MIT's Technology Review has become one of my favorites. You can flip through the pages of the site by selecting it from among the fifty or so sources for Fast Filp. going to the easily because they cooperate with Google. One of the best things about this site is that they don't mislead with over hyped headlines and sketchy information. Here are just a few of the stories that have caught my attention lately. Gasifying Biomass with Sunlight: A solar-driven process could yield far more fuel than conventional biomass production. Making Solar Cheaper with Natural Gas: Florida Power and Light has built a solar power plant linked to a natural gas plant. Catalysts for Plastic Recycling: Chemical process can recycle PET bottles at lower temperatures. Ultra-Efficient Gas Engine Passes Test: A novel fuel-injection system achieves 64 miles per gallon. These classes are being offered by the Time Dollar Community Connections (an alternative currency coordinator in San Antonio's impoverished west side with support from Green Spaces Alliance. All classes take place in the community garden behind the Time Dollar house across the street from Divine Redeemer Presbyterian Church at 2806 W. Salinas. San Antonio, Tx 78207. Each class will be taught by Andrew Willems an experienced gardener and community organizer. Call (210) 433-9851 for more information. Thur April 29th 10:00 A.M. Wed May 5th 10:00 A.M. Wed May 12th 10:00 A.M. Wed May 19th 10:00 A.M.
Thur May 27th 10:00 A.M. Some folks will argue that cats themselves are not sustainable due to their propensity to kill off small song birds. The mining of clay for cat litter has had a devastating effect on the environment. Nevertheless just as there is appropriate design for humans there is appropriate design for cats which takes into account their need for height, safety and easy climbing throughout their lives. The most famous cat centric home is the "Cat's House" which is a otherwise unremarkable suburban ranch home in California. A more modernist approach to a cat lifestyle is Asahi Kasei’s Plus-Nyan house. You can find pictures of it on Apartment Therapy and Crooked Brains. These calzones are stuffed with a combination of corn and broccoli, but you can use whatever you have in your fridge. Part-skim ricotta and mozzarella make our pizza pockets lower in saturated fat. Plus a whole-wheat crust adds a nutty flavor and extra fiber. Serve with your favorite marinara sauce for dipping. 1. Position racks in upper and lower thirds of oven; preheat to 475F degrees. Lightly grease two baking pans. 2. Combine broccoli, corn, mozzarella, ricotta, scallions, basil, garlic powder, salt and pepper in a large bowl. On a lightly floured surface, divide dough into 6 pieces. Roll each piece into an 8-inch circle. Place a generous 3/4 cup filling on one half of each circle, leaving a 1-inch border of dough. Brush the border with water and fold the top half over the filling. Fold the edges over and crimp with a fork to seal. Make several small slits in the top to vent steam; brush each calzone with oil. Transfer the calzones to the prepared baking sheets. 3. Bake the calzones, switching the pans halfway through, until browned on top, about 15 minutes. Let cool slightly before serving. Healthy Heart Variation: To reduce saturated fat even further, use nonfat ricotta in place of the reduced-fat ricotta. 334 calories, 2 g saturated fat. Tips: To remove corn kernels from the cob: Stand an uncooked ear of corn on its stem end in a shallow bowl and slice the kernels off with a sharp, thin-bladed knife. This technique produces whole kernels that are good for adding to salads and salsas. If you want to use the corn kernels for soups, fritters or puddings, you can add another step to the process. After cutting the kernels off, reverse the knife and, using the dull side, press it down the length of the ear to push out the rest of the corn and its milk. Look for balls of whole-wheat pizza dough at your supermarket, fresh or frozen and without any hydrogenated oils. Nutrtion Bonus: Vitamin C (35% daily value), Calcium (25% dv), Vitamin A (20% dv). Here's a link to an essay by Terry Tamminen on the Fast Company website. He gives several reason why he believes that coal has been unmasked as not only a dirty source of power but also as an uneconomical one. The makers of "The Story of Stuff" are back with an entertaining analysis of the forces selling us bottled water. You can watch it below or even better go to the storyofstuff.org website. 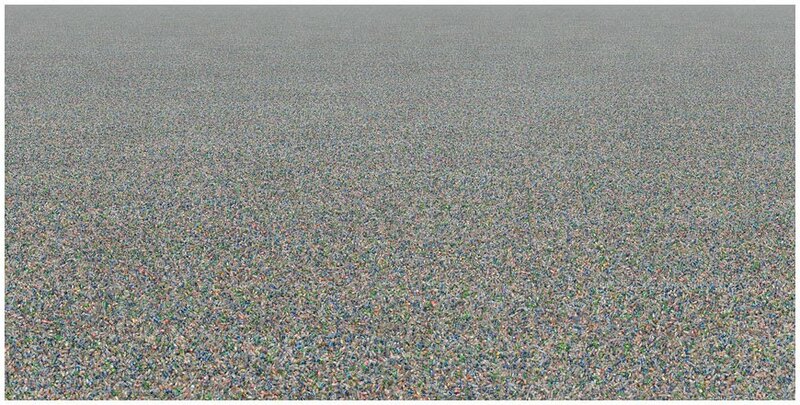 More than one writer has connected The Story of Bottled Water to Chris Jordan's mind blowing depiction of the two million plastic beverage bottles consumed in the USA every five minutes in his "Running the Numbers" project. Are you the kind of person who maybe goes to two or three San Antonio Sustainable Living meetings a year? You really ought to be coming to these meetings more often since the price of admission cannot be beat (FREE!). However, if you are particular about what topics are worth your time, this is one of those topics - WATER. Oh sure, you've been to water presentations at the San Antonio Sustainable Living before, and yes, they've been very informative and innovative. Still, we only have about one presentation per year on water issues (I keep track of these things), so you can't say this is all we talk about. This Tuesday's presentation is, trust me, the most important and encompassing water presentation we will have for a long time. We are more familiar with water source issues. We are at the center of rainwater harvesting activity in the country. We are familiar with the excellent guidelines and programs offered by the San Antonio Water System regarding water efficiency and sensible landscaping. Build San Antonio Green has promoted wise water use for many years in their family of programs. But very little attention has been given to graywater systems. Graywater systems, in brief, makes the most out of water by making it work for you more than once. Very few have addressed this category of water efficiency. Wayne Haese has been developing water use systems for many years and is a multiple award winner from the San Antonio Water System. I've been looking at a lot of water systems, and Wayne Haese's GrayScaping System is the most comprehensive, but simply elegant use of graywater I've seen. He has designed systems from individual houses to entire housing developments incorporating graywater recycling systems with rainwater recovery augmentation, and has also developed proprietary systems he calls RainPonics, GrayPonics, TreeScaping, FireScaping, and more. For additional information, visit his website. But by all means, do not miss next week's meeting in the classroom inside Whole Foods Market in the Quarry at 7pm. This aromatic, fiber-packed, and tasty Middle Eastern dish is great served alone or over brown rice or pasta. Using fire-roasted tomatoes is not necessary, but gives the stew a delicious smoky flavor. Heat broth in a large saucepan. Add onion and sauté on medium heat for about 5 minutes, until golden. Add garlic, cumin, and coriander and cook for 2 minutes, stirring frequently. Add dried lentils, bay leaf, and water to pan and bring to a boil. Lower heat and add lemon juice, tomatoes and their liquid, artichokes, and crushed red pepper (if using). Simmer for about 20 minutes, until the lentils are tender. Remove and discard the bay leaf. Add salt and black pepper, or to taste. This recipe is a preview from the upcoming NEW EDITION of The Survivor's Handbook: Eating Right for Cancer Survival. •Combine all the ingredients for the sauce in a blender. Add the water and blend until smooth. • Heat the olive oil in a large pan. Sauté the tofu and vegetables. • Add enough of the Indonesian sauce to cover, plus a few extra Tbsp. Cook until reduced and thickened. • Serve over rice or tossed with soba noodles. They've received funding from ARPA-E. MIT professor Dan Nocera says his system allows water from a puddle to be used to be split using a trickle of electricity from a photovoltaic panel with the help of a catalyst. The hydrogen obtained from the water would be stored and burned. The hope is that the energy your house needs could be produced at your own home. Sun Catalytix of Cambridge Massachusetts is in the early stages of developing the process for commercial use. Here's a link to an interesting story from E Magazine.com. It mainly concerns the conflict between two competing lumber certification schemes. One accuses the other of engaging in greenwashing. Christine MacDonald, is also the author of Green, Inc.: An Environmental Insider Reveals How a Good Cause Has Gone Bad . Is raw meat right for your cats? At a recent Green Drinks, I held forth on the raw meat mixture I make for my cats. Since not everyone was totally bored by my monologue I thought I'd add information on it to the blog. When two of our older cats were diagnosed with kidney problems I did some research and found out about raw meat diets for cats. Many people believe that cat foods that which include vegetables and cooked meat are responsible for many cat diseases including kidney problems. Cats are pure carnivores who don't know how to cook so the thinking is that their food should resemble the food they eat in the wild, which is basically whole raw mice and other small mammals. Since ground raw mice are not available in stores, and breeding, slaughtering and grinding mice is just gross, mixtures that use chicken instead have been developed. I use Dr. Lisa Pierson's raw meat formula. But my cats wouldn't touch the small chunks of bone that the meat grinder produced or the ground chicken skin so I use boneless skinless thighs instead of leg quarters. Along with the thighs I grind liver. I set aside two 2 1/2 pound batches of the ground chicken/liver mixture and freeze them for later use. I add the required vitamins and nutrients to the last 2 1/2 pound batch. After mixing it well I put into some ice trays that I use for nothing else. Once they freeze I take the meet cubes out of the trays and store them in a ziploc bag. My cats continue to eat dry food along with the raw meat, which is unusual among raw meat eating cats and may not be recommended. But since they won't eat the bones or skin I hope that the dry food provides some missing nutrients. Two years after starting my two elderly calicos on the diet, one is doing well while the other passed away a couple of months ago. Until her kidneys completely gave out the last week or two of her life she thrived. She ran, jumped, climbed, played and explored. (She was also bulimic but that's another story.) Once one of the calicos passed away our other inside cat started eating the raw meat. She and her surviving auntie seem to really enjoy it. It takes me about an hour to prepare each batch and to clean up. If you try the diet I recommend that you try to use the leg quarters. They are much cheaper than the thighs and the bones and skin provide essential nutrients. Be sure to read up on the diet and decide whether you think it is safe and effective. 1. Toast almonds in sauce pan over medium heat 3 to 5 minutes, or until fragrant and beginning to brown, stirring often. Cool. 2. Wipe out sauce pan; add oil and onion. Saute onion 2 to 3 minutes, or until translucent, stirring occasionally. 3. Stir in ginger, quinoa, and juice, and season with salt and pepper, if desired. Bring to a boil. Cover, reduce heat to medium-low, and simmer 15 to 20 minutes, or until all liquid is absorbed. 4 Remove from heat, and scatter peas over cooked quinoa. Cover, and let stand 10 minutes, until peas are thawed. 5. Stir apple, coconut, and almonds into salad. Serve warm or at room temperature. Title: Grey Water Provisions on Residential Applications. Purpose: To clarify the acceptable provisions regarding the use of grey water on residential applications. Question: Can I discharge the gray water from a residential washing machine directly onto the ground surface on the exterior of a residence? Limited to single family dwellings only. Irrigated areas must be in a fenced-in area and in control of the occupant of that residence. The area must be limited use and access by residents, pets and foot traffic. Cannot be used during times of rain. Irrigation must not create a public health nuisance such as surface ponding. The irrigated area must support plant growth such as grass, bushes, or be overlaid with a vegetative cover. The discharge point of the hose shall be kept a minimum of 10 ft from the property lines. The Director of the Health Department may suspend this practice if he determines that it creates a negative impact on the community health. Stephen found this video on Babelgum. "This is a forward-thinking idea to solve the problem of searching for a parking place as well as putting more money in a meter without having to run back to your car." was his comment.